So I’ve become obsessed with Peacocks, since I made that peacock for my swap partner, and I was reading the Meet Me At Mikes book, which had a project by Kristen Doran in it. 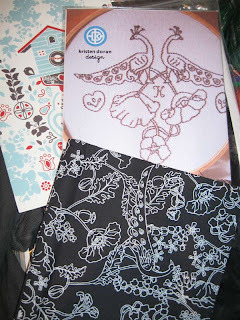 Kristen was one of my Totem artists, so I popped along to her blog to see what she was up to. From that I wandered over to her shop blog to see what she had on offer and right up the top, the very first item I saw, was an embroidery pattern for two peacocks. So I bought one. It arrived yesterday in the post. God bless the internet for first taking away the need to send letters and then giving us so many more reasons to post things around the country and indeed the world. At the top is the pattern, and since I’d had a chat to her over email about the aforementioned peacock obsession, she popped in a fat quarter of peacocks in gardens too. How nice was that? I’m so happy, I can’t wait to start it. As soon as I finish moving and finish all the other half done projects I’m currently mired in. I see it as a late night telly in front of the heater kind of project. Thanks so much Kristen! I didn’t buy it, but it made me think of Curlypops and her beautiful aprons made out of retro teatowels. 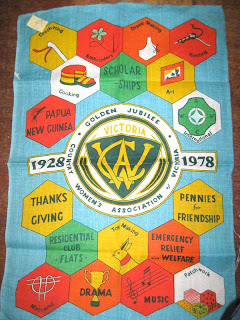 What could be cooler than an apron made out of a CWA tea towel? In totally other news, I sent my contrubution off to A Book About Death. It’s now on the website, with heaps of other entries. If you’re not going to be in New York over Sept/Oct, go check it out online! Love the peacocks. 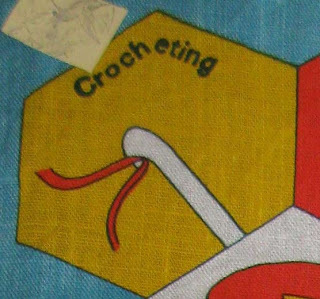 I might have to boy the embroidery project too. Where did you see that tea towel? It's gorgeous. I can't believe you left it behind. Isn't it beautiful? I can't wait to sew it. The teatowel was left regrettably behind as I didn't have the spare cash for it. Plus, I'm moving house and trying to de clutter. It's in LOST AND FOUND on Smith St, in the first stall on the left right behind the stairs. Next to the sewing stuff stall. I'd love it to go to someone I know! Next post: Home Made Help book on presale now!